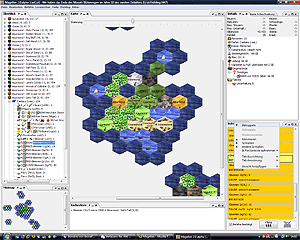 Magellan is a full-featured client tool for the play-by-e-mail game Eressea, Allanon and other PBeM. It displays a map of your part of the Eressea world, supports you in writing orders, performs many complex calculations for you and is available completely in English. 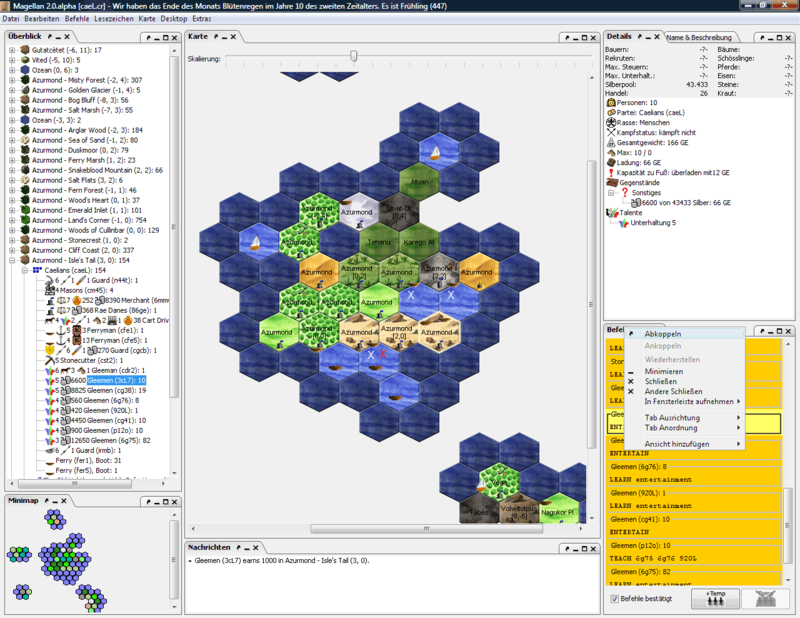 Magellan 2.x is a logical progression of the Magellan client. The changes in the software were so extensive that we decided to give it a new, much higher, version number. Magellan 2.x now needs, contrary to Magellan 1.x, Java6 (1.6.0 or higher). Additionally it is now a JAR file that has a setup that unpacks and installs the whole application on your computer. The application is now split into multiple files, so you're able to change texts and icons as you want. Magellan 2.x also offers some new features. With the help of the Infonode Docking Framework you can now customize your Magellan desktop to your own tastes and needs with a single mouse click. You don't need to edit any configuration files anymore. Furthermore Magellan 2.x now has a split code structure, which makes it possible to develop server or console applications without a graphical user interface. Magellan is only one among many other client programs for Eressea and is in no way related to the developers of Eressea. To relieve them of unnecessary work please contact the Magellan Community in case you have any questions or problems. Can I Run Magellan on My Computer? Magellan is built using the platform independent Java technology and therefore runs on MS Windows, Linux, MacOS X and some other operating systems. However, it requires a rather powerful machine, especially when your faction grows bigger. The minimum system requirements are a 450 MHz processor and 128 MB RAM, but 800 MHz and 512 MB RAM are recommended. For Magellan, Java 1.6 or newer is required. Java is a platform independent programming system. Actually, you do not really have to worry about that. After installing Java on your computer once, all you need is to download Magellan. Consisting only of a single file, you can run it like any other program from then on. Is Magellan a Quality Product? Well, for one thing, Magellan was able to achieve Enno's Seal of Excellence. According to the Eressea poll in December 2001 Magellan seems to be by far the most popular tool among the Eressea players.